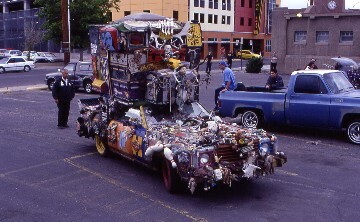 5/5/2003 I woke up early with no alarm set in time to take the first Hiawatha to Chicago and officially on my way home. I showered quickly and packed up before checking out to walk back to Amtrak on a very foggy dripping morning. At 6:02 AM the conductor opened the door and turned the passengers loose on the train. Our consist this morning was Cabbage Car 90222, 54531 Rebuilt, 54527 & 54504 red seats, the 54525 rebuilt and 139 P-42 DC. The train ran south through the heavy morning rain with my day's planning changing as the rain falls as we sped along. We made our way to Sturtevent where a good number of passengers were waiting under umbrellas. Soo Line 4443 was waiting for us to clear so he could get back to his work. Conductor Mussini made sure I knew about the Metropolitan Lounge in Chicago and that all my meals would be free so eat heartily. We entered Illinois then pounded the EJ&E diamond at Roundout. We crossed over to make our next stop of Glenview before we crossed back over at Morton Grove to resume our high speed running. We paused at the Mayfair Crossing where an ex CNW train blocked our path while a CTA Blue Line train was heading down the expressway below towards O'Hare. At the junction with the Metra Elgin Line, a long eastbound was waiting for us to clear. We stopped at Western Avenue due to congestion at the CNW crossing there. 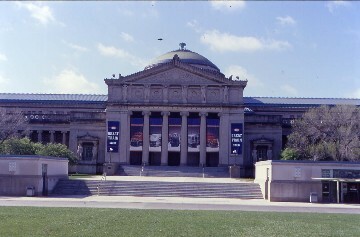 The clouds had lifted so I am back to the original plan of going to the Museum of Science and Industry. We arrived in Chicago Union Station five minutes early and I saw one of those new Metra engines behind an F-40C being tested. I stored my bags in the Metropolitan Lounge then went upstairs for Hot Cakes and Sausage. After I ate, I walked first to the Lake Street Bridge for pictures before going to ground level at the Canal Street crossing, another excellent place for picture taking. Once I had my fill, I walked over to the CTA Green Line stop on Clinton and caught Train 616 to Garfield. There I connected with the CTA X55 Garfield Express Bus to the front steps of the Museum of Science and Industry. As the bus pulled up to the front I noticed huge banners for "The Great Train Story" and walked out onto the lawn for a picture. 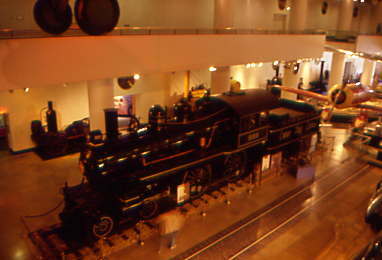 I descended into the Great Hall and the first thing I noticed was the Pioneer Zephyr on display in the very north end of the hall. After paying admission, I attempted to photograph this unique train in the dimmed light. My timing was perfect as a tour of the train was about to take place. We would board and go back in time to ride the record breaking dawn to dusk trip from Denver to Chicago in 1934. They took us into the baggage room and the train started moving, really motion added to stimulate the train heading down the tracks. Next we walked into the express room where we met Zeph, the talking mule who told his story about the amazing run of the Zephyr. This was followed by sitting in the men's coach section or smoking area in those days. Next we went into the regular coach section where mechanical passengers told us about their journey on this trip. Through the rear door we went into the first class section getting to meet Mr Budd of the CB&Q along with his daughter and granddaughter who through the use of video in the rounded rear end observation windows showed us views of the journey, arrival in Chicago, the Chicago Fair and fireworks. I detrained wondering since I just went from Denver to Chicago can I count those miles? After a low light picture of the rear of the Zephyr, I toured the operating cab, engine room and Railway Post Office. My ride and tour of the Pioneer Zephyr was now complete and I lived out a part of history. 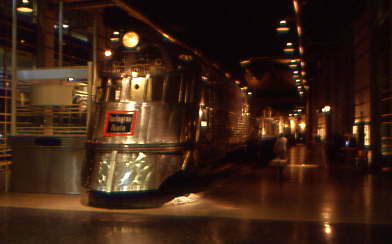 I next toured the rest of the museum seeing of course "The Great Train Story" with the New York Central 999, the first vehicle to go over 100 MPH and replicas of others like "The Rocket". The main part of the display is the huge model railroad featuring 34 trains racing along 14,000 feet of track on a cross country trip from Chicago to Seattle. I then went through the rest of the museum except the U-505 submarine which I saved for another visit. I made my return via the 55 line CTA bus with a very friendly driver then the Green Line train 605 back to Clinton. I returned to Union Station for a Char Dog lunch, a call home and to relax in the Metropolitan Lounge until train time. This is always interesting to watch passengers leaving to board their trains such as the Empire Builder which I wish I was going on and the California Zephyr with a been there, just did that one before they called my train, the Southwest Chief to take me home to Southern California. My walk to board was from the back door of the lounge down the whole length of the train starting with the road railers forward to the first sleeper, the South Dakota. I was greeted by Edward Clayton and went up to my room to prepare it for my journey. 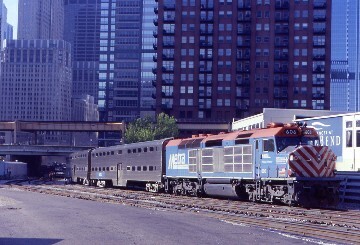 The eastbound Southwest Chief and California Zephyr both arrived into Chicago early on this date before we departed on time. With our rear end business already on the train we headed to Naperville then out the Race Track for the Illinois Countryside. At Mendota I clicked off a picture of the CB&Q 4978 on display there. Listening to John Cougar's "Scarecrow" crossing all that farmlands with its small towns really hit a mark with me. After Galesburg, I photographed the Chief on the Cameroon Connection as I waited my time for dinner. Dinner lasted from 6:30 PM until 8:45 PM and took place in three states although I only ate in two. I had a mere roll in Illinois, nothing in Iowa and in Missouri had my order taken, by La Plata my Delmonico Steak arrived and had a Chocolate Bundt Cake for dessert well after dark. Jackie our waitress worked half the dining car by herself with no help and not really knowing what she was doing. The Stewart finally assisted one table but of course it was not mine. It was the most striking lack of teamwork that I had ever seen in an Amtrak dining car in all of my miles. Some of my better jokes and stories helped pass the time. Like I always say, "Every trip is an adventure!" Since the sun had set a long time ago, I returned to my room knowing I did not have to face the sun blaring into my room and enjoyed some Blue Oyster Cult into the night. I went to bed after Marceline. 5/06/2003 I woke up to the sound of Attendant bells ringing away which meant God wanted me up at 5:55 AM CDT. I walked back to the lounge car, got a cup of tea and watched the Kansas landscape pass. I thought about Steve Walsh of Kansas solo song, "Every step of the way!" as lightning flashed off in the northwest. I went to the dining car as the Chief went through a squall line with lightning, heavy rains and some hail as I enjoyed a much quicker meal of French Toast. The couple sitting across from me were vanned from Champaign to Chicago but had to pay for that as Amtrak did not provide an on time bus for that City of New Orleans that was delayed by the Tennessee tornados. After I took a wonderful shower with shampoo provided, we reached Lamar, Co where through the trees I shot a picture of the Santa Fe 1819 on display there. We passed the John Martin Reservoir as we approached our servicing stop of La Junta where I could detrain for forty five minutes. I recorded our trains consist which was: Engines 83, 196, 189 and 76, Baggage 1246, Transition 39021, Sleepers 32109 South Dakota and 32027, Diner 38034, Lounge 33007, Smoking Coach 31503, Coaches 34092 and 34057, Express Box Cars 71167, 71181 & 71195, Express Track 74104, 74005, 74042 & 74049 and 462073, 460253, 462147 462102, 462198, Roadrailers 462207, 460044 & 462079. I ran into Andee, a Coach Attendant on this trip who I knew from the San Diegan and it is always great to see her. Once I got to the east end of the consist, I walked over to Loves for a two liter bottle of Coca-Cola and a pack of Ding Dongs. We left La Junta on time. The train sped on across the high plains as Pikes Peak became cloud free for just a few minutes. We paused briefly at Trinidad before we made a rather quick trip over Raton Pass into New Mexico where we sat waiting on time. I had Uriah Heep "Live" on as we made our way to Las Vegas, down to the Pecos River and up Glorieta Pass. 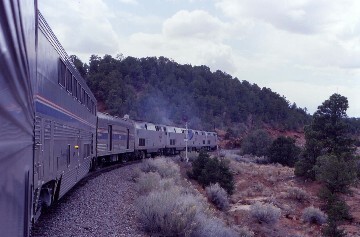 I shot pictures of our train slowly descending down the south side of Glorieta. At Canyoncito we went into the siding and I went to the lounge car for the passage of the 17 car eastbound Southwest Chief. That was followed by our trip through Apache Canyon to Lamy. We headed to Albuquerque with an hour twenty five minute layover. I walked to a store in town for a USA Today before I called home with no answer then Trainweb to learn that the Mighty Ducks had defeated the Dallas Stars since you can not get a West Coast sport score due to the lateness of the game compare to when the newspaper has to be ready to go. A very special thank you to Richard Elgenson for knowing who won that game. I bought Karen my wonderful Amtrak agent a blanket before taking a picture of a "Junk Car" that had been seen on Ripley's Believe it or not. I caught up with Andee, before going to my room to listen to the Young Dubliners "Alive, Alive" and read the USA Today as they removed the196 from our consist to be used on Train 4 tomorrow. The train left Albuquerque ten minutes late and with that I went to the dining car with me having another Delmonico Steak and Chocolate Bundt Cake. We sped west through Grants to the Continental Divide and into Gallup chasing the sun west while I listened to the Scorpions "World Wide Live". The sun snuck down west of Gallup and the Chief headed out into the Arizona night where I made up my bed and called it the last night of this trip. 5/7/2003 Up at 5:30 AM as the train is leaving Barstow, I went to the dining car which was running late in opening and met by a very rude Jackie before I went to the lounge car to wait for the diner to open. I had only two choices pancakes or eggs so you all know which one I took. I managed to get the last sausage with my pancakes and I had to remind Jackie about our Orange Juice as the poor lady sitting across from me had nothing to wash down her meal with. With her husband, they are making a Chicago, LA, San Francisco to Chicago triangle. We climbed the east face of Cajon Pass before getting stuck in a train traffic jam just east of Summit. We finally headed down the 3% south track with trains all over the pass. It has to be one of the busiest Wednesdays that I have ever experienced on Cajon Pass on this very overcast and gloomy morning. We made our way to San Bernardino before heading to Riverside and onto Fullerton where I detrained a rested passenger but one who is one hour fifty four minutes late. I detrained and went up to the Trainweb offices finding Ray and Shivam there. I brief them about my trip and cleaned out my E mail while I was there. I called home telling my mom to be at Santa Ana at 9:23 when 566 would drop me off. At least that was the plan. Train time came and went with no announcements from the station. A call to Julie on the Amtrak 800 number I learned the train was 18 minutes late at that point. It finally arrived thirty minutes later with Conductor Rick Reyes greeting me and telling me of the door problems 566 was having. 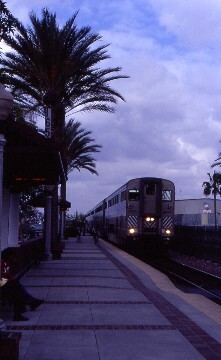 It was a Surfliner set and we could not leave Fullerton until Rick had gone back to the engine to reset something to get us on our way. We made it through to Anaheim with no more door problems then arrived at Santa Ana where my mother had patiently waited for my late train. That brought another interesting Amtrak adventure to a close.